Renowned clothing brand Lala Textile has introduced it’s newest fall-winter collection titled Mashaal Khaddar/Khaadi By Lala. This season Lala has presents embroideries and graphical tribal prints which is inspired by Folk Art. This winter collection will be available at all their leading stores from 4th, October. 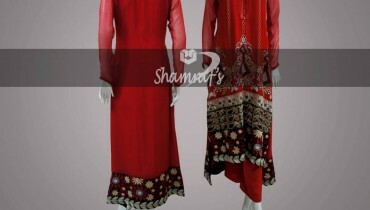 The price of these dresses is so affordable PKR 2’550 only. Lala Khaddar / Khaadi Collection consisting of fabulous 7 intricate designs, the collection utilizes is fusion of Khaddar, Khaadi, Cotton, Organza with pure satin laces, embroidered patches, bodice, embroidered motif, neckline embroidery and matchless panel embroidery. Lala Textile has no much need of introduction because it is most famous manufacturing textile of our country and since 1947 it is play and great role in fashion industry of Pakistan. Now they known also worldwide because of its innovative pattern designs and goof quality fabrics. Let’s have a closer look at complete catalogue of Lala Textile – Mashaal Exclusive Khaddar / Khaadi ’13.